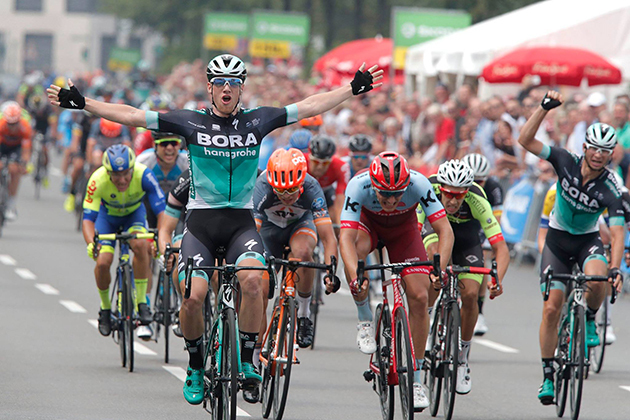 In a gripping sprint finale on the streets of the inner city of Cologne, Sam Bennett was able to keep his rivals at bay to win the oldest German road race on the calendar. As expected, it all ended in a bunch sprint, and after a long day in the saddle, the Irish rider emerged victorious ahead of M. Raim and M. Kittel. 2 RAIM, Mihkel ISRAEL CYCLING ACADEMY s.t. 3 SAJNOK, Szymon CCC SPRANDI POLKOWICE s.t. 4 JONES, Brenton DELKO MARSEILLE PROVENCE KTM s.t. 5 KITTEL, Marcel TEAM KATUSHA - ALPECIN s.t. 6 GROSSER, Aaron TEAM SAUERLAND NRW s.t. 7 LIENHARD, Fabian NATIONALMANNSCHAFT SCHWEIZ s.t. 8 STEIMLE, Jannik TEAM VORARLBERG SANTIC s.t. 9 KRIEGER, Alexander LEOPARD PRO CYCLING s.t. 10 DE BIE, Sean VERANDA`S WILLEMS - CRELAN s.t. 11 PFINGSTEN, Christoph BORA - HANSGROHE s.t. 12 ROHDE, Leon HEIZOMAT - RAD-NET.DE s.t. 13 DELTOMBE, Kevin SPORT VLAANDEREN - BALOISE s.t. 15 BOVIN, Guillaume ISRAEL CYCLING ACADEMY s.t. 16 WARLOP, Jordi SPORT VLAANDEREN - BALOISE s.t. 17 KANTER, Max DEVELOPMENT TEAM SUNWEB s.t. 18 HUPPERTZ, Joshua TEAM LOTTO - KERN HAUS s.t. 19 DEBUSSCHERE, Jens LOTTO - SOUDAL s.t. 20 CARSTENSEN, Lucas BIKE AID s.t. 21 SBARAGLI, Kristian ISRAEL CYCLING ACADEMY s.t. 22 PORSEV, Alexandr GAZPROM - RUSVELO s.t. 23 LEYDER, Pit LEOPARD PRO CYCLING s.t. 24 BROCKHOFF, Jan LEOPARD PRO CYCLING s.t. 25 FRANCZAK, Pawel CCC SPRANDI POLKOWICE s.t. 26 WOUTERS, Enzo LOTTO - SOUDAL s.t. 27 MAMOS, Philipp TEAM DAUNER D&DQ AKKON s.t. 28 VAN GESTEL, Dries SPORT VLAANDEREN - BALOISE s.t. 29 HALLER, Patrick HEIZOMAT - RAD-NET.DE s.t. 30 ZABEL, Rick TEAM KATUSHA - ALPECIN s.t. 31 MASSON, Christophe WB-AQUA PROTECT-VERANCLASSIC s.t. 32 DE GREEF, Robbert ROOMPOT - NEDERLANDSE LOTERIJ s.t. 33 FRIESECKE, Gian TEAM VORARLBERG SANTIC s.t. 34 THALMANN, Roland TEAM VORARLBERG SANTIC s.t. 35 MAES, Nikolas LOTTO - SOUDAL s.t. 36 HODAPP, Johannes TEAM SAUERLAND NRW s.t. 37 RUTSCH, Jonas TEAM LOTTO - KERN HAUS s.t. 38 MORTIER, Julien WB-AQUA PROTECT-VERANCLASSIC s.t. 39 BAK YTTING, Lars LOTTO - SOUDAL s.t. 40 EL FARES, Julien DELKO MARSEILLE PROVENCE KTM s.t. 41 LEVEAU, Jeremy DELKO MARSEILLE PROVENCE KTM s.t. 42 LÜBBERS, Dorian TEAM LOTTO - KERN HAUS s.t. 43 SPRENGERS, Thomas SPORT VLAANDEREN - BALOISE s.t. 44 GOLDSTEIN, Roy ISRAEL CYCLING ACADEMY s.t. 45 PELLAUD, Simon NATIONALMANNSCHAFT SCHWEIZ s.t. 46 EEKHOFF, Nils DEVELOPMENT TEAM SUNWEB s.t. 48 VAN WINDEN, Dennis ISRAEL CYCLING ACADEMY s.t. 49 TESHOME, Meron BIKE AID s.t. 50 ABRAHAM, Meron BIKE AID s.t. 51 ORRICO, Davide TEAM VORARLBERG SANTIC s.t. 52 WARNIER, Antoine WB-AQUA PROTECT-VERANCLASSIC s.t. 53 SCHELLING, Patrick TEAM VORARLBERG SANTIC s.t. 54 SALMON, Martin Alexa DEVELOPMENT TEAM SUNWEB s.t. 55 SCHILLINGER, Andreas BORA - HANSGROHE s.t. 56 REKITA, Szymon LEOPARD PRO CYCLING s.t. 57 VERWILST, Aaron SPORT VLAANDEREN - BALOISE s.t. 58 REINDERS, Elmar ROOMPOT - NEDERLANDSE LOTERIJ s.t. 59 LAGUTIN, Sergey GAZPROM - RUSVELO s.t. 60 VAN DER SANDE, Tosh LOTTO - SOUDAL s.t. 61 NOWAK, Florian TEAM LOTTO - KERN HAUS s.t. 62 WIPPERT, Wouter ROOMPOT - NEDERLANDSE LOTERIJ s.t. 63 MERTZ, Remy LOTTO - SOUDAL s.t. 64 MACIEJUK, Filip LEOPARD PRO CYCLING s.t. 65 VAN SCHIP, Jan Wille ROOMPOT - NEDERLANDSE LOTERIJ s.t. 66 VAN GOETHEM, Brian ROOMPOT - NEDERLANDSE LOTERIJ s.t. 67 MAIKIN, Roman GAZPROM - RUSVELO s.t. 68 PALUTA, Michael CCC SPRANDI POLKOWICE s.t. 69 GALL, Felix DEVELOPMENT TEAM SUNWEB s.t. 70 ARMEE, Sander LOTTO - SOUDAL s.t. 71 TRUSOV, Nikolay GAZPROM - RUSVELO s.t. 72 PEYSKENS, Dimitri WB-AQUA PROTECT-VERANCLASSIC s.t. 75 HUGGER, Jan TEAM LOTTO - KERN HAUS s.t. 76 THIÈRY, Cyrille NATIONALMANNSCHAFT SCHWEIZ s.t. 77 GRADEK, Kamil CCC SPRANDI POLKOWICE s.t. 78 VAN BREUSSEGEM, Elia VERANDA`S WILLEMS - CRELAN s.t. 80 BENEDETTI, Cesare BORA - HANSGROHE s.t. 81 GROSSSCHARTNER, Feli BORA - HANSGROHE s.t. 82 MARTINEZ, Yannick DELKO MARSEILLE PROVENCE KTM s.t. 83 DOWSETT, Alex TEAM KATUSHA - ALPECIN s.t. 87 KOCH, Jonas CCC SPRANDI POLKOWICE s.t. 88 TACIAK, Mateusz CCC SPRANDI POLKOWICE s.t. 90 DUIJN, Huub VERANDA`S WILLEMS - CRELAN s.t. 91 LIVYNS, Arjen VERANDA`S WILLEMS - CRELAN s.t. 92 DE KETELE, Kenny SPORT VLAANDEREN - BALOISE s.t. 93 FOLIFOROV, Alexander GAZPROM - RUSVELO s.t. 99 SISR, Frantisek CCC SPRANDI POLKOWICE s.t. 102 BRAUN, Julian TEAM DAUNER D&DQ AKKON s.t. 103 HEIDER, Christopher TEAM DAUNER D&DQ AKKON s.t. 104 DOMBROWSKI, Frederik TEAM DAUNER D&DQ AKKON s.t. 105 RÜEGG, Lukas TEAM VORARLBERG SANTIC s.t.